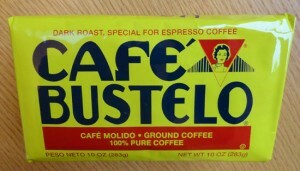 Footnote: I bought the Cafe Bustelo for about $3.65 at Big Lots. You simply must check out Big Lots, if there is a store in your town. I have a coffee press, but always forget to use it. At work they have a pod maker, so I have reloadable pods that have worked well for me. Deb, it’s an acquired taste, like smoking. I haven’t started smoking yet. I have occasionally tried to acquire that taste (not smoking) because I actually like the aroma of coffee. But it’s not for me. Oddly enough, neither my brother or sister-in-law like it either, even though both sets of our parents drank coffee almost religiously. But maybe it’s one of those generation-skipping things, because one of my two nieces does drink Starbucks, as long as it is dosed up with milk and sugar!